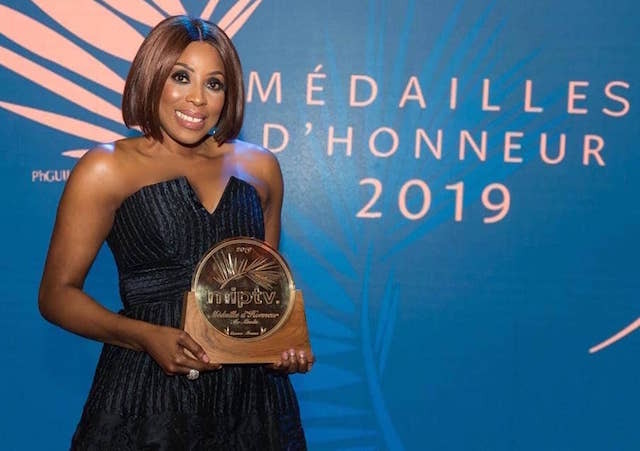 Mo Abudu, CEO of Nigerian broadcaster Ebonylife TV, was honoured with a Medaille d’Honneur award at the international content market MipTV in Cannes this week. The award was presented to the noted TV producer and Nollywood filmmaker by Camille Bidermann, executive director of the International Academy of Television Arts & Sciences, the organisation behind the International Emmys. “A major part of my acceptance speech was dedicated to the creative business leaders in the room and the need for a partnership between our respective continents, so that our stories can be told with authenticity and produced to the best international standards,” said Abudu right after the Tuesday evening event. Abudu shared the stage with three other people honoured with Medaille d’Honneur awards that night: US writer, showrunner and producer, Ilene Chaiken; chairman of Banijay Group in France, Stéphane Courbit; and MD of the UK’s Sky Vision, Jane Millichip. “The first African to receive this award,” continued Abudu. “Basking in the glory of receiving my award. I share this award with the EbonyLife team, I thank all our partners, sponsors, my family, my dearest mother, my darling Temidee and Koko and of course my bestos that have helped and supported us on our journey. Most important of all, I had to give God all the glory. Only HE makes all these incredible things possible in my life!” she added. MipTV’s Médailles d’Honneur are awarded to senior executives who have made a significant contribution to the world of television and the development of the international TV community through their talent and leadership.